Mission Medical is working to ensure every person in the Pikes Peak Region has the opportunity to live and thrive on their own. The Independent Living Program at Mission Medical Center makes available needed items, on a first come first serve basis, to assist in people being self-sufficient. Gently used items are provided at no cost. Items may or may not be new, but our team of volunteers will do their best to ensure that each item is clean and in proper working order. When an item is no longer needed, please return it so someone else can receive the benefits. Other items may be available, please call to see what is in stock. Donations are accepted Monday through Friday from 9:00 AM to 5:00 PM at 2125 East LaSalle Street, upper level. Items may be picked up by appointment, please contact Georg at 719-434-4742 or (719) 219-3402 x 1008. A Mission Medical Independent Living Program Success Story! ​While a patient at Memorial Hospital a paraplegic, with limited use of his arms and confined to a wheelchair had his power chair stolen. Medicaid would not pay to replace the stolen chair. 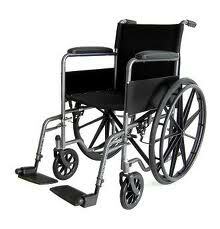 A call was placed to Mission Medical inquiring if there was a power chair available. MMC answered the call for help, and help we did! An ambulance brought the patient to Mission Medical. He was lowered out of the ambulance in a manual wheelchair. Waiting for him was a power chair provided by the MMC Independent Living Program. The MMC staff had goose bumps, and more than a few tears as they watched the excited look on individual’s face. He was so happy; he had his life back, the freedom to move on his own. The EMTs helped him into his new chair and he just smiled. As he drove his new chair into the ambulance, still beaming he beeped the horn. He was so grateful for the gift of Independent Living. Mission Medical clinic does change the lives of the people in the Pikes Peak Region. This is just one of many ways MMC helps. Please call to schedule a tour to learn more and see for yourself.